Without an impulsive remark from Annie Watsham to Gurkha rights campaigner Peter Carroll, Joanna Lumley might never have become involved in the lobbying campaign that led to Gurkha military veterans gaining settlement rights in the country they fought for. Watsham remembered that Lumley had donated a substantial sum to her years earlier for a charity walk in Nepal due to Lumley’s Gurkha connections (her father served with a Gurkha regiment for 30 years) and mentioned that Lumley could be interested in supporting the cause to Carroll while he was collecting signatures for a petition. Lumley’s efforts in spearheading the campaign for Gurkha veterans are widely credited with creating the public momentum that finally brought about changes in the law to allow veterans to settle in the UK. Mr Carroll became involved in the campaign in 2003, when he was first approached to assist a retired Gurkha who was facing deportation from the UK after 22 years’ service in the Army. Although, Mr Carroll could not remember Ms Watsham’s name, he launched a search for her through the Kent Messenger newspaper and other local press after the Government’s announcement and she came forward. This week the two women finally met. Ms Lumley said: “It’s very thrilling to meet her for the first time. It’s just brilliant what she did. 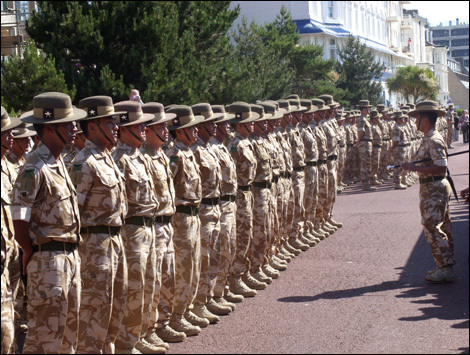 On the same day, Lumley also took part in celebrations in Folkestone, Kent, where the 630 members of the 2nd Battalion the Royal Gurkha Rifles (2 RGR) were given the freedom of the town to mark their return from service in Afghanistan and also the victory of the campaign for their settlement rights. Addressing the crowds of supporters, she said: “I just wanted to say how thrilled I am to be here today, celebrating giving the freedom of your town to these remarkable men and their families.